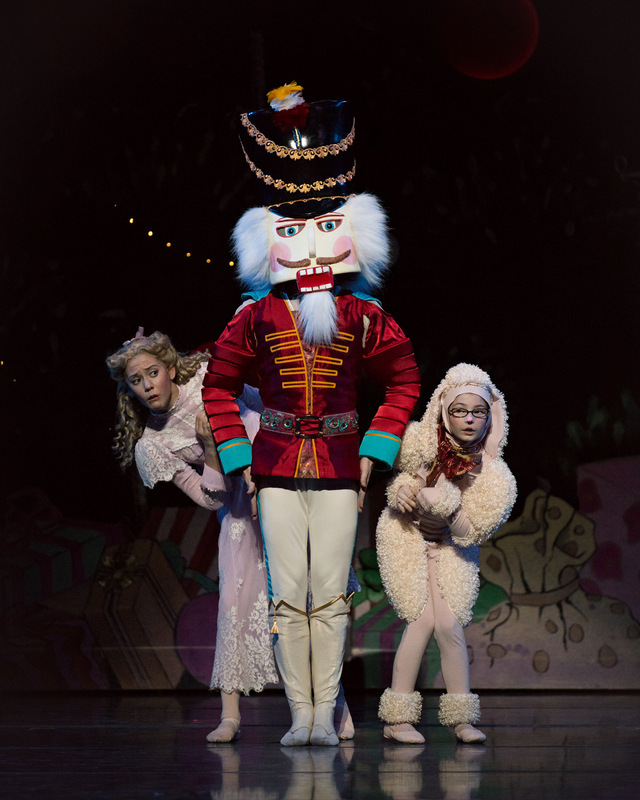 Frisch’s Presents “The Nutcracker” Performed by the Cincinnati Ballet, Dec. 19-27, 2014…. 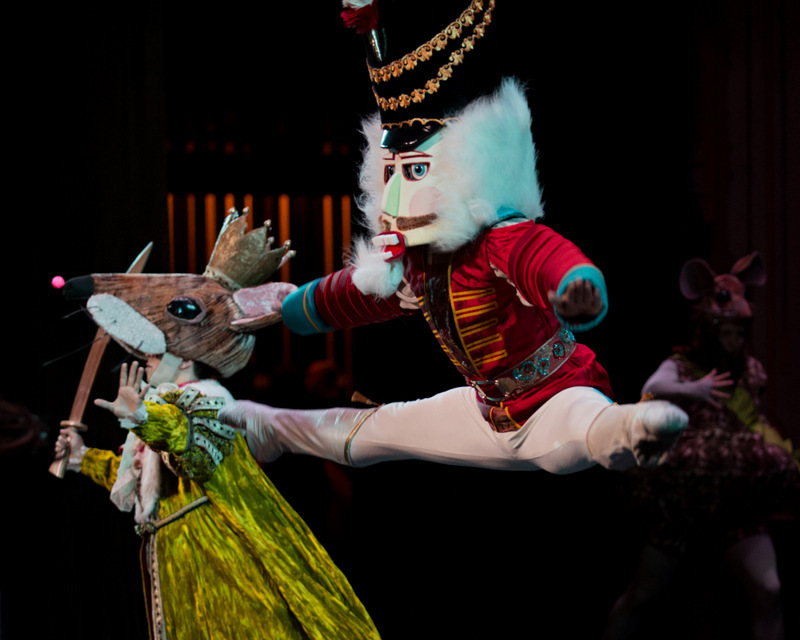 Cincinnati Ballet in “The Nutcracker”. Photo: Peter Mueller. Victoria Morgan, Artistic Director for the Cincinnati Ballet has taken one of ballet’s most iconic pas de deux, The Nutcracker pas de deux and recreated a dance that fits comfortably in the 21st Century. Now that is saying something indeed when you realize The Nutcracker pas de deux, first choreographed by the legendary master of dance Marius Petipa, was first performed in in 1892 at the Mariinsky Theatre in St. Petersburg. But let’s be honest, at 122 years of age, The Nutcracker pas de deux needed a little tweaking, a bit of spit and polish and updated for the 21st Century. For the millennials in the crowd, think of it as The Nutcracker pas de deux v. 2.0. Ms. Morgan gave it a much needed upgrade. Now many a balletomane we cry foul and fall weeping in the center aisle, of that you can be sure. Stodgy dance critics (the ones who never like anything, anyway) will storm out of the theater in righteous indignation. I mean after all, it was good enough for Anthony Dowell and Leslie Collier to perform at Covent Garden,,,but, ahh folks, that was in ‘70’s. The Nutcracker pas de deux is a dance for the Sugar Plum Fairy and Prince Coqueluche in the ballet The Nutcracker. It is performed all over the world, probably being performed somewhere right now as you are reading this…The pas de deux and the codas are staples for the International ballet competitions, Varna to Tokyo, Moscow to Jackson, Miss…. Ms. Morgan has remained true to Petipa’s original choreography (historically speaking dance scholars think it’s the original choreography, but I digress…) What is unique is that she has merged elements more often found in Contemporary Ballet as opposed to Classical. In Ms. Morgan’s updated version, the rigidity of the Sugar Plum Fairy’s torso has been replaced with a torso that is allowed to move and is freer. The positions des bras (position for the arms) have breath and show more fluidity. The male dancer is not there just to lift and carry the ballerina across the stage, instead he is more engaged, an active partner. Most importantly, the choreography is more embracive of the musicality that is in Tchaikovsky’s score. **Also, just a little side note, if you’re fan or admirer of the Cuban School of Classical Ballet (like I am), the Cincinnati Ballet has several Cuban dancers of note. Yosvani Ramos, former dancer with the Australian Ballet, Venus Villa, formerly with the English National Ballet, Rolando Sarabia, Gold Medalist at USA IBC in Jackson Competition, Mississippi, Romel Frometa and Gema Diaz, both formerly with the Ballet Nacional de Cuba, and one of my favorite male dancers dancing today, Cervillo Amardor, a Principal Dancer with the Cincinati Ballet since 2004. …Also, be sure to catch Jenessa Touchet as the Snow Queen…she gives a remarkable performance…. Lighting Design: Trad A Burns. « Kim Brandstrup’s “Leda and the Swan” with Zenaida Yanowsky & Tommy Franzen….